Pearson Collection, Paris; sale, Paul Cassirer and Hugo Helbing, Berlin, 18 October 1927, lot 22 (illustrated). R. Fernier, La vie et l'oeuvre de Gustave Courbet, Catalogue raisonn, Lausanne, 1978, vol. II (Peintures: 1866-1877, Dessins, Sculptures), p. 96, no. 720 (illustrated, p. 97). Paris, Galerie Fiquet, Courbet, November-December 1926, no. 9. Courbet left Paris for Etretat in early August 1869, and returned at the end of September having painted twenty seascapes, two of which he chose to save for the Salon the following year. "We are very comfortable in Etretat," he wrote to his family in September. "It is a charming little resort place. There are rocks here that are bigger than in Ornans, quite curious" (P. ten-Doesschate Chu, Letters of Gustave Courbet, Chicago, 1992, p. 352, no. 69-7). These views of Etretat differed greatly from the marine scenes that Courbet painted during his visits to Trouville and Deauville further south on the Normandy Coast in 1865. In these earlier works, the sea and beach mainly served as the backdrop for his portrait paintings. For whatever reasons, either personal, or due to specific requests from dealers such as Durand-Ruel and Haro in Paris, Courbet chose not to include people in any of the paintings from Etretat in 1869. It has been suggested that the lack of humanity in these works, and especially Courbet's interest in showing abandoned boats, may have signaled his concern that the onslaught of tourism was ruining the fishing industry in towns such as Dieppe and Etretat (see S. Faunce and L. Nochlin, Courbet Reconsidered, exh. cat., Brooklyn, 1988, p. 60). Courbet worked almost non-stop during this time at Etretat, and the result was twenty paintings depicting either waves crashing on the shore (see lot 28), or the giant cliff at Etretat, viewed from different angles. In fact, it was these two subjects that Courbet chose to exhibit in the Salon of 1870. 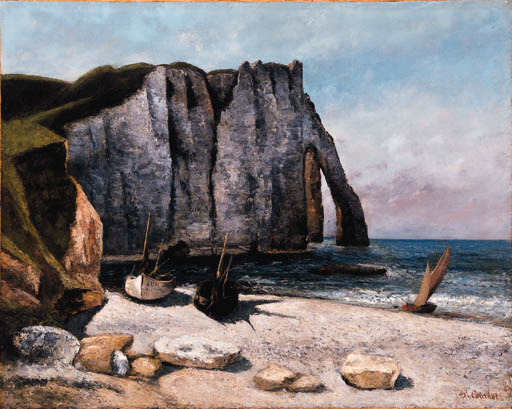 The present work depicts a view of the cliff at Etretat called the Porte d'Avale, and shows the impressive rock from a different angle than Courbet's 1870 Salon entry of the same subject (Fernier, no. 745). Courbet also made two other versions of the present painting (Fernier, nos. 718 and 721). One may surmise that the rocky terrain of the Normandy coast appealed to Courbet in much the same way as the landscape of his native Ornans, a region also characterized by its imposing rock formations. The rough surfaces of the stones with their crags and crevices, provided Courbet the opportunity to work with a palette knife, and emulate the hard, weather-worn verneer of rock that had been altered by the forces of nature. In Courbet's own words, he once said of the rocky cliffs of the Jura, "Try a brush to do rocks like that, rocks that have been eroded by the weather and the rain, which have formed long seams from top to bottom" (P. Courthion, Courbet racont par lui-mme et par ses amis, Geneva, 1948, p. 200). Most likely Courbet painted the dramatic cliff of Porte d'Aval by using a palette knife loaded with grey and blue paint to depict the giant cliff. He applied contrasting tan and beige tones to capture the various forms of the large rocks scattered on the sandy shore. At the same time, he is able to emulate the texture of the frothy waves as they break on the shore and at the base of the cliff by applying a coarse, textured surface which contrasts with the slick application of paint that defines the distant sea and sky. Two abandoned boats cast shadows on the sand while sails of a smaller vessel blow in the wind. Courbet's scenes of Etretat represent the majesty and power of nature, and are the forerunners of Monet's paintings of the same subject completed over ten years later. This painting has been authenticated by Jean Jacques Fernier. He believes that it is a later replica (after 1873) from Courbet's Swiss period, and that the painter, Ernest Brigot may have executed the rocks. Fernier believes the signature is apocryphal.